Everyone has a circadian rhythm or biological clock that establishes his or her sleeping patterns. Alzheimer patients, however, often experience a disruption in their circadian rhythms that leave them asleep during the day and awake at night. There are several ways to help Alzheimer’s patients regain their sleeping schedule. Past research has focused on light therapy in general, while more recent research has been focusing on the benefits of blue light therapy. The benefits of light therapy can be as effective as some medications but without the negative side effects. Lights that have a blue tinge to them are thought to benefit Alzheimer’s patients with their sleep because they help regulate their circadian rhythms. 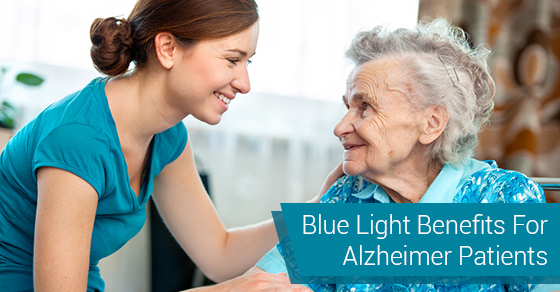 The blue light does this by providing the body with a cue to “wake up,” meaning that if they are exposed to blue light during the day, alzheimer patients will feel more alert. Some researchers believe that it is helpful because blue lights mimic the colour of the blue sky, which signals that is daytime. In addition, blue lights may increase the level of melatonin in the body, a hormone that helps to regulate waking and sleep cycles. By increasing the level of melatonin in the body, this will help the body to sleep at night as well as leading to a better quality of sleep. Keep in mind that blue lights are not used at night but if they are used during the day, this can help Alzheimer’s patients sleep at night. Bright light therapy, which involves exposure to a bright light (five to 30 times brighter than office lights) has also been associated with positive results for Alzheimer’s patients who experience problems sleeping. Similar to blue light therapy, bright light therapy regulates circadian rhythms in both those with seasonal affective disorder, for which this therapy was originally intended, as well as alzheimer patients. It should be noted that you should not attempt any form of light therapy without the guidance of a medical professional first. Ensure that the alzheimer patient gets sunlight in the morning. If they can get two hours of exposure to sunlight every day, this can help promote sleep at night. Establish a night time routine by having patients go to bed at the same time. Also limit distractions such as loud music and promote a comfortable sleeping environment with a temperature-controlled room. C-Care Health Services offers a variety of affordable, personalized and high-quality services. Contact us today to learn more.